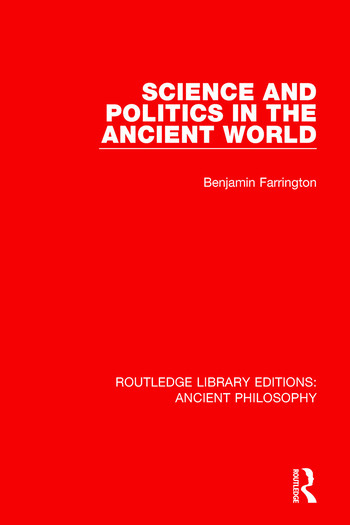 This book, originally published in 1965, discusses the political implication of the spread of science in antiquity. It reveals how the real Greek spirit of scientific research was crushed by Plato and Aristotle, long thought-of as searchers for truth. Historian such as Polybius and Livey and the poets Pinder and Virgil are seen in a new light when set against this background of social struggle. Benjamin Farrington was an Irish scholar and professor of Classics, teaching in Ireland, South Africa , and Great Britain. Although his academic career spanned several disciplines, he is most well known for his contributions to the history of Greek science. Moreover, within the development of the discipline his books were some of the first written in the English language that focused specifically on Greek science.